This summer, thanks to one of Barb's suggestions in the Summer Sizzle Outdoor Hour Challenge Ebook, we decided to plant sunflower seeds in pots on our apartment balcony. It has been such fun to watch them grow this summer! 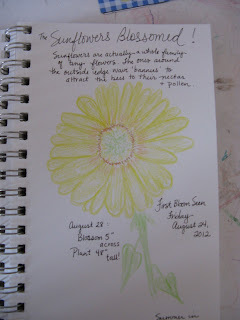 We started them from seed on June 26, and have periodically measured and sketched them as they grew. 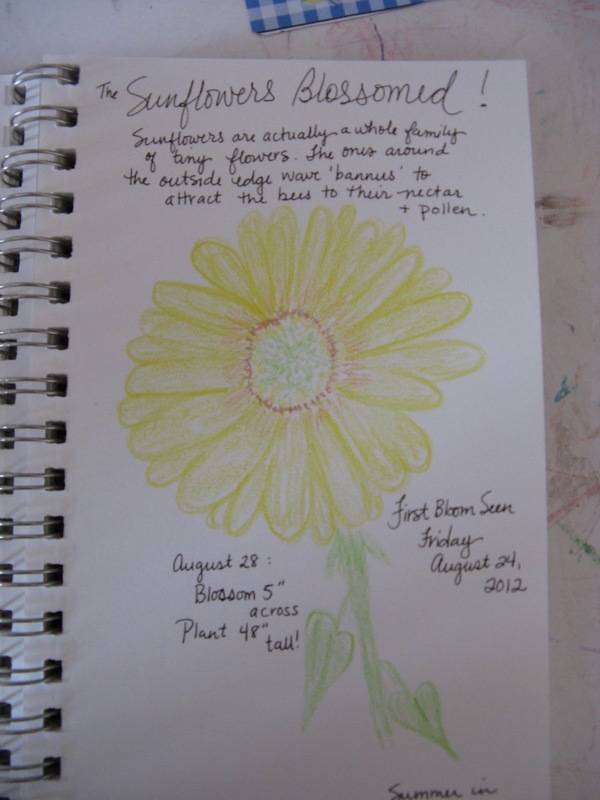 A couple of Michelle's sketches of the progress of our sunflower plants. On August 24, our first flower actually blossomed! So we took some time to observe our flowers carefully using the grid provided in the ebook. We like to take photos of our nature subjects and put them up on the computer screen so we can easily sketch the details. The leaf has yellowish dots on it and the rest is green. The leaf has a heart shape with a tip on the bottom and going up like the shape of the heart. It feels fuzzy wuzzy wuzzy. The flower is a circle that goes around and around and around. It is a flower family - that means there are a lot of flowers. Its colors are bright yellow and orange. That bit about the sunflower being a "flower family" was new to me - an interesting tidbit gleaned from The Handbook of Nature Study (the actual book, not the blog. =)) Sunflowers are composite flowers, meaning that the "flower" is actually made of many small flowers all clustered together. And sure enough, if you look carefully, the center of the flower is made up of many tiny flowers. The flowers around the outside edge are waving 'banners' (petals) to attract bees to their nectar and pollen. Kinda interesting, isn't it? Yup, the sunflower has outgrown Michelle. This was truly a simple nature project that I think anyone can do...even if you don't consider yourself outdoorsy or happen to live on the 4th floor of an apartment building in the middle of the downtown area of your city. ;-) Also, the sunflowers grew fast and watching them grow has kept my young children interested all summer - so also a good project for little ones with short attention spans. I highly recommend it if you are looking for a way to get your feet wet with Nature Study! This is such a great example of how you can include nature study just about anywhere...even on your apartment balcony. Wonderful journals and the last photo says it all! Wow! What a great entry! Love the nature journal and that last photo of your daughter with the sunflower. Like Barb said, this is a perfect example of how we don't have to have much room to still accomplish some nature study!